The body of an 87-year-old woman whose husband was brutally beheaded earlier this month was pulled from a Georgia lake Friday afternoon, authorities said. Shirley Dermond had been missing since the headless body of her husband of 68 years, Russell Dermond, 88, was discovered May 6 in the garage of their million-dollar home in the gated community of Great Waters on Georgia's scenic Lake Oconee. 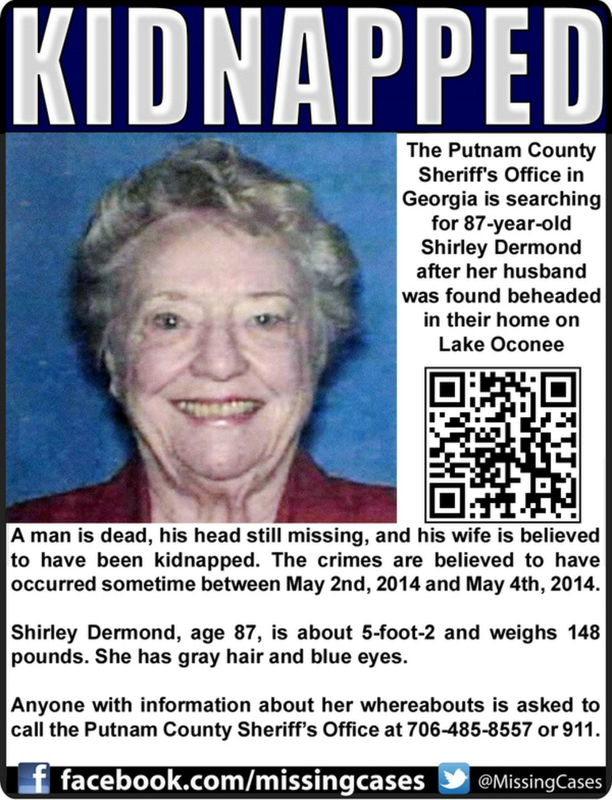 Putnam County sheriff's officials treated Shirley Dermond's disappearance as a kidnapping. Her purse and her phone were left behind, as were both of the couple's cars. Formal identification of the woman's body awaited a state crime lab examination, but Sheriff Howard Sills said Friday that he was confident it was that of Shirley Dermond because of "the physical description of her — the hair color, as well as surgical scars that I was aware of." The body was found by two fishermen "a good 5 to 6 miles from the Dermond home," said Sills, who said that while Shirley Dermond's head hadn't been removed — unlike her husband's — "it most definitely is a homicide." Sills would give no other details, but he indicated that the discovery Friday did little to clear up the mystery surrounding the savage attack. Russell Dermond's head still hasn't been found, he said. The FBI had offered a $20,000 reward for information specifically leading to the arrest of Shirley Dermond's kidnapper or kidnappers — meaning the fishermen who found the body don't qualify. Sills said he still had very few leads, but he said whoever committed the murders was "a homicidal individual that doesn't deserve to breathe the air of this Earth."